"Memory can change the shape of a room, it can change the color of a car, and memories can be distorted." We often take our memories for granted. All of us are born with the ability to make memories, and those memories shape who we are. They form a blueprint of our lives that tells us where we have come from, what we have learned, and where we are going. If we are unable to remember an experience or event, that experience might as well have never happened. How do we continue to experience life when we are robbed of the natural ability to create and retain our memories? This is the unimaginable dilemma that has befallen Leonard Shelby in Memento, the film noir masterpiece from writer/director Christopher Nolan. On the surface, this is a routine thriller that finds Leonard seeking revenge on the men who raped and murdered his wife and left him permanently brain damaged. Unable to retain new memories for more than fifteen minutes as a result of his injury, Leonard must rely on a complex system of Polaroid photographs, hand written notes, and eerie body tattoos in order to keep the "facts" straight on a quest to avenge his wife's death. The revenge theme has been done numerous times before, but Christopher Nolan has taken the genre to a new level by turning conventional narrative upside down, inside out and quite literally, backwards. Memento begins with a brutal murder sequence committed by Leonard himself and from here the film moves backward in time to find the reasons behind Leonard's violent motivations. As a result of the backwards flow, we do not simply see how a man in Leonard's condition feels, but experience it first hand, knowing only what he knows at that moment, not yet aware of what he has done fifteen minutes prior. Throughout the film, he meets a number of people who are seemingly key to his life, but none of whom can be trusted because he does not know the basis of their relationship to him. Who can Leonard trust? Where do his true motivations lie? What the heck is going on here? These questions kept me on the edge of my seat. Memento is the type of involving, interactive experience I wish more films embodied. Perhaps what moves me most about Memento is its insistence to keep the audience involved even long after the picture has ended. After my first viewing, I took a deep breath and scratched my head in an absolute state of confusion. It was not until hours later when I began to piece it together that I could make sense of it. As I continued to embrace the film's riddles, I began to formulate astonishing answers. I have now seen Memento five times, and with each new experience I have gained more insight into the film's inimitable story line. I cannot wait to experience it again and see what subtle plot devices unravel next. Image Transfer Review: This new release boasts that the film has been mastered in high definition. While these words seem like nothing more than a marketing ploy, the 2.35:1 anamorphic widescreen image transfer is a subtle, yet noticeable, improvement over the already stunning original DVD. The picture exhibits a smooth and blemish-free aesthetic, especially commendable for a low budget film. Colors are rich and fully saturated; gone are the orange fleshtones that marred several scenes on the initial release. Black level is beautifully rendered, as is shadow detail. Minor film grain is evident throughout the black & white scenes, yet this is likely intentional as it adds to the mood of these sequences. Overall, this is a beautiful transfer with nothing that will distract from the engaging experience of the film. Audio Transfer Review: The original Dolby Digital 5.1 and Dolby Surround 2.0 mixes are offered again, but this limited edition DVD goes one step further with the inclusion of a DTS 5.1 soundtrack. The DTS is preferred, but the Dolby 5.1 mix also appears to have been tastefully remastered. David Julyan's beautifully haunting musical score gently flows through the surrounds, creating an enveloping soundfield. There is not much in the way of split surrounds, as there is not any real need of them; any more than what is given would have probably sounded gimmicky. Dialogue is crisp and clear with only a slight hint of distortion in a few scenes where the actors raise their voices. The tightened bass is the most noticeable improvement over the original DVD soundtrack, which displayed a bothersome emphasis on the lower mid range. Low end still tends to sound a bit boomy and distorted in spots, as is often expected with lower budget recordings. Both the DTS and Dolby tracks are incredibly satisfying and certainly exceeded my expectations. Extras Review: Those hoping for a plethora of extras on this disc will likely be disappointed at first glance. Just remember that, like the film, there is much more than meets the eye. It appears as though the producers wanted to create an enigmatic experience, right down to the packaging. They have succeeded. Fans of Memento and heavily interactive DVD experiences will enjoy working their way through the elusive menu screens, and while I found them somewhat exasperating at first, persistence has led me to amazing discoveries. Having to go through a mandatory psychological evaluation any time I wanted to get to a simple feature got frustrating rather quickly, but I soon found that there is a much more simple way to access them. I was able to reach several hidden features by playing around with the psych tests, including additional artwork, a bizarre rambling in one of Leonard's journals, and the long sought after chronological edit of the film (more on that later). Much like the story, as I continued to embrace the riddles of disc two, I began to find astonishing answers. As puzzling as it may be, stick with it. Through perseverance will come great rewards. Disc one exhibits a similarly bizarre structure, but a bit more tame. After fidgeting about for half an hour, all I was able to discover is how to run the audio commentary in reverse for the final ten minutes of the film. I am still trying to find a reason behind this oddity. I listened to the feature-length commentary by Christopher Nolan with great trepidation, as I feared that he might give away secrets to the film that are better left for the viewers to figure out on their own. While his track is not terribly exciting, I am pleased to say that Nolan is careful about what he says and how he says it, and does not weaken the film's experience. Nolan comes across as an extremely articulate and intelligent fellow, though he often sounds as if he is merely going through the motions, dictating what is seen on screen rather than elaborating on it. The commentary does not undermine the film, but it does little to strengthen it. The production stills and sketches are a blas� collection of photos and location sketches as well as a series of storyboards; I would have liked to have seen more emphasis on the storyboards. A second stills section contains promotional artwork and posters for international campaigns. In a twist of irony that seems to go along with the backwards notion of the film, the theatrical trailer is presented in 4:3 full frame, while the international trailer is shown in 1.85:1 nonanamorphic widescreen. Regardless of aspect ratio gripes, both trailers are quite effective and created chills down my spine, even after having seen the film numerous times. 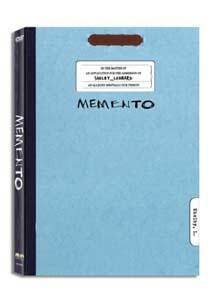 Memento Mori is the short story by Christopher Nolan's brother, Jonathan Nolan, on which Memento is based. The entire story can be read using the arrow buttons on the remote control, and I found it to be a fascinating read. It is an excellent companion piece to the film, as its story line mirrors Leonard's history prior to the narrative events seen in the film, a history only subtly implied by Memento. Anatomy of a Scene is a wonderful Sundance Channel special covering the structure of the film, particularly the fantastic method in which it was edited. Featuring candid interviews with the filmmakers, this intriguing documentary is a great roadmap for anyone who may be confused by the non-linear narrative of the feature. At first glance, it appears that the director's shooting script is what justifies a second disc. Instead of viewing the script solo, the user is offered a choice to toggle back and forth between the script and the 2.35:1 anamorphic widescreen film using the angle button on the remote. The script is interesting in that it is covered with scribbles and cross-outs, almost as if Leonard Shelby had gotten a hold of it. Honestly, the script was very distant in my mind while viewing this section. What was on my mind was the unusual nature in which it is presented. If the intention was to allow viewers to read the script over the movie, why do they appear on two completely separate angles? With all of disc two's brain-bending puzzles, I figured there very well may be a way to access the main feature on disc two in the often-discussed version in chronological order. Sure enough, with a little persistence, I was able to find a way to access the full-length, re-edited version of Memento. It is a challenge to find, but not terribly difficult. Good luck! While probably not everyone's cup of tea, Memento is, at very least, one of the most interesting and original films to be released in recent years. This new two-disc set is structured in a purely enigmatic fashion that guarantees one must work hard for their entertainment. Casual viewers will most likely find this puzzle an irritation, while fans should have a blast deciphering its secrets. Confusing special features aside, the film has never looked or sounded better on DVD. I consider this limited edition to be the definitive version of Memento.